Jon Ferrera, founder and CEO of Nimble, holds strong memories for me. You see it was Jon I was speaking to when the disastrous Christchurch earthquake struck on February 22nd this year – a story I’ve already recounted on this blog. Even before that day however, I’d been watching Jon’s startup very closely for a bunch of reasons. The company that Ferrrera is working on now, Nimble, is one that leads on from his background when he co-founded one of the first CRM companies, GoldMine, back in 1989. GoldMine later sold to Ixchange (now known as FrontRange) in 1999 for $83 million – Jon is therefore someone to watch when it comes to CRM. Nimble is intended to be the most natural and intuitive social CRM platform on the market – a lofty objective given the number of companies there are playing the space. 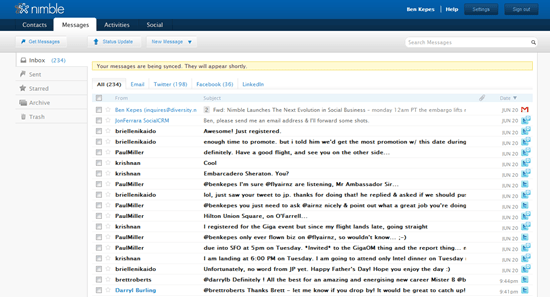 Nimble’s approach is to unify communication channels – be they email, Twitter, LinkedIn or Facebook, into one consistent UI. They then tie in an individual’s calendar and in doing so create a unified and connected CRM loop giving an individual real transparency over processes and the ability to keep a handle on an ever increasing velocity of communications and contacts. I’ve had a Nimble account since early on in the beta program – it’s an early stage product and hence has the odd unavoidable bug but it does what it sets out to do and provides me with a consistent view of my contacts, activities and communications. One thing that Nimble hasn’t really tackled up to know is the problems around teams collaborating around contacts, messages and activities. The fact of the matter is that all but the solo freelancers need some way of working on this stuff as a team, something that Nimble hasn’t really cracked yet. However the version that Nimble is rolling out today looks to deliver on these needs as well. Nimble is announcing a team collaboration feature set that takes them from being a great place to manage an individual’s multiple relationships, to being the place to manage an entire teams relationships and communications. The new version aims to enable groups, departments and entire companies to listen and engage with their social community and to collaborate around the communications within that community. The entire Nimble platform will be extensible via an open API and they are also launching a marketplace later in this year which will (hopefully) see third party developers build industry and use-case specific add ons to the core Nimble offering. 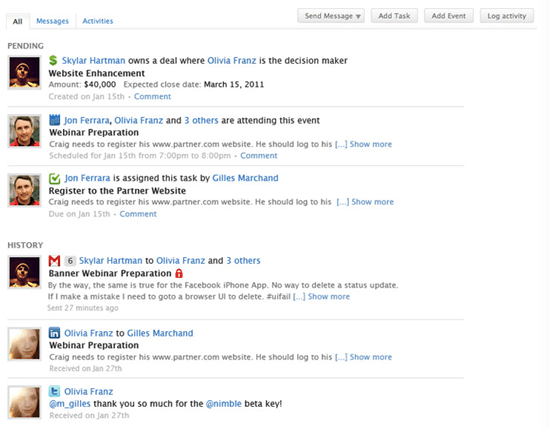 As I’ve said previously, the social CRM space is awash with companies wanting to change the world. Given Ferrera’s palmarès however, and the level to which they’ve been executing thus far, Nimble is certainly one of the ones to watch.